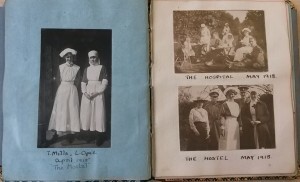 As thousands of wounded returned from the Front, extra hospitals opened across Cornwall and many young women volunteered for basic medical training to help nurse the injured and maimed. Between 1914-1918 an estimated 90,000 women signed up nationwide, many hundreds in Cornwall, for the Red Cross, the Order of St John, and the Queen Alexandra’s Imperial Military Nursing Service. As part of our exhibition at the Royal Cornwall Museum, Truro, in 2017, a costumes expert recreated a WW1 nurse’s uniform. Click here to see photos. Several large houses across the county were turned into nursing homes. One which became a convalescent home for officers was Scorrier House, near Redruth. Lily Opie, who joined a group of local young women who helped out there, kept an autograph book with photos, signatures and poems from the officers recovering there. They went on outings, danced and sang. The key thing: to lift spirits and think about anything other than the war. 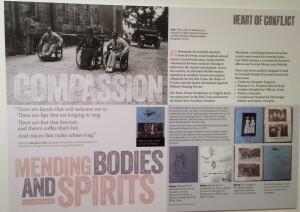 – Convalescent Hospital for Discharged Soldiers and Sailors, Newquay.